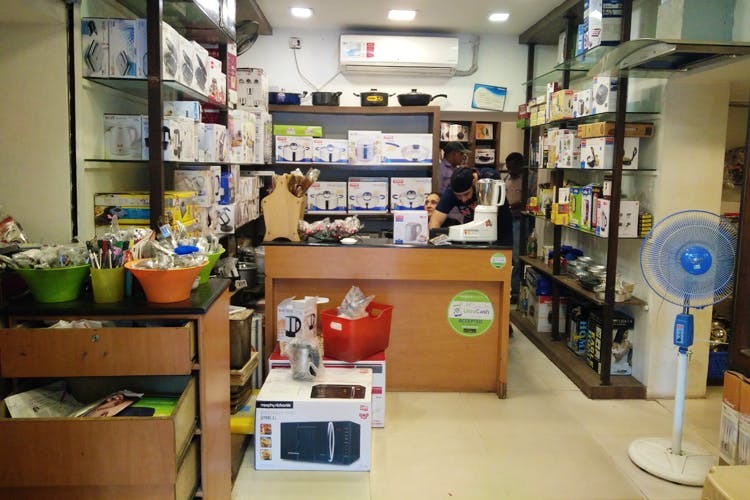 From chakla belan to kitchen chimneys, Pots And Pans in Indiranagar is your one-stop shop for all your kitchen needs. On busy CMH Road in Indiranagar, easy-to-miss Pots And Pans is the soul shop for many with basic and not-so-basic kitchen needs. Some of you will remember it from its days on Brigade Road, next to Sweet Chariot. And really, in its 37 years of existence, apart from their address, nothing has changed! From a variety of basic spoons to inbuilt ovens and much-needed rolling pins to kitchen chimneys, Pots And Pans stays true to its name. They don’t believe in selling any-and-every brand; they only store what they consider the best. If you’re absolutely clueless about what to buy, just go with the staff’s recommendations. The recommendations are apparently quit reliable. Cutlery, crockery, tiny pressure cookers to really good kitchen knives, you name it, they have it. For anybody in need of any bake ware, walk in and you’ll be pleasantly surprised. Silicon cupcake moulds to large aluminum star-shaped ones, frosting brushes to oven toaster grillers, your baking needs will all be taken care of there. Brand loyalist? Hawkins, Prestige, Panasonic, Morphy Richards and Borosil are among the brands they sell. They have a variety of other home needs that include nifty ladders, ironing boards and clothes dryers. If this wasn’t enough, they also provide services for the products they sell, and while you’re making a decision on your purchase, they tell you exactly why a certain product would be better than the other.